Here’s one I’ve mentioned before, but this is a request for information and an early warning. This one is important, and very, very elusive, but I think we should preserve this bit of Brownhills History for posterity, and so that it is not lost. It’s a beautiful thing, and not enough folk know about it. Like the late, great Dicky Dorsett, we are in danger of forgetting one of the greatest sons Brownhills has ever known, and that would be a crime. 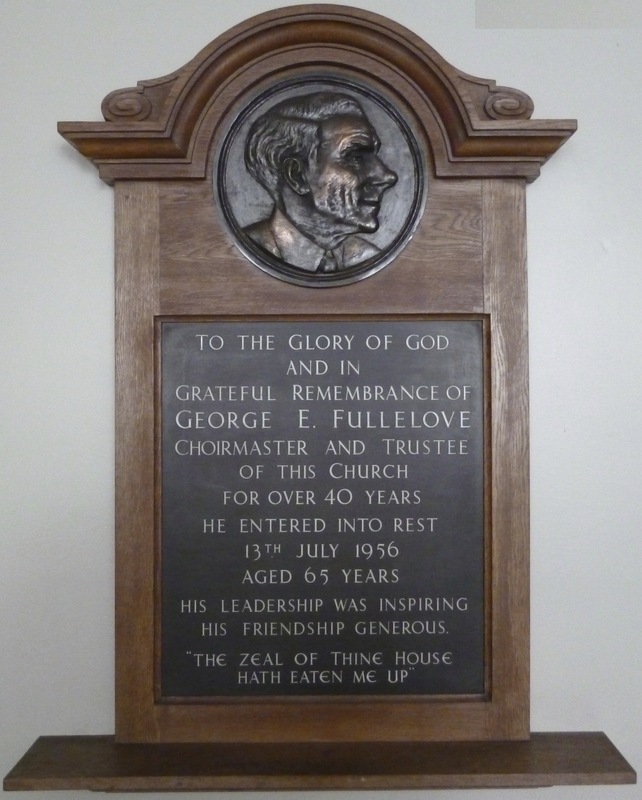 I am, of course, talking about chorister, composer and choirmaster George Fullelove. A remarkable plaque to a remarkable talent. Image very kindly supplied by David Evans. George was a renowned choral artist, and not just in the local area. This humble man was well known and recognised in his day, but his work and memory is gradually being lost because, quite simply, nobody has ever really told his tale. I’d like, if we can, to rectify that. George is commemorated in a number of places within Brownhills. His name was adopted for a road on the Catshill estate, and there is the Fullelove Memorial Shelter, the curious octagonal structure at the bottom of The Parade opposite the former Annex, often mistaken for a bus shelter. This is odd, as there is no plaque or sign on or around the edifice recording the name Fullelove at all. There is a plaque in the Silver Street Methodist Church in Brownhills, which David Evans has kindly photographed for us. I wasn’t aware that this existed at all. Was Yer Ferther A Miner? To dig out black diamonds that shine? Deep in the dark bowel face of the mine? So mine owners their profit could make? Of the days of pit-props and horse hoof? And sight of widows – children their faces pale? ‘Ar them days of hard work were mine’. Since George died in 1956, there must be those still with us who remember this very talented, gentle and kind man. There must be written records of his music still extant, and possibly even some kind of audio recording. Knowing how music runs in the blood of Brownhillians, there must be a great story to tell. Please, it you have anything, do get in touch. Please comment here, or mail me at BrownhillsBob at Googlemail dot com. Cheers. This entry was posted in Brownhills stuff, Churches, Clayhanger stuff, Followups, Fun stuff to see and do, Interesting photos, Local History, Local media, Local music, News, Reader enquiries, Shared media, Shared memories, Social Media, Walsall community, Walsall Wood stuff and tagged balladeer, Brownhills, Brownhills Choral Society, Brownhills local history, choir, Choral, Clayhanger, David Evans, George Fullelove, Local History, Master, New Photos, Plaque, Road, Shelter, Silver Street Methodist Church, Singer, Staffordshire, Things to do, Walsall Wood, was yer further a miner. Bookmark the permalink. I understand that George Fullelove founded the Brownhills Music and Verse Speaking Festival in 1944. Perhaps readers may have certificates , rosettes, cups or photos etc from this important long-standing important annual event they would like to submit to the blog…….